I recently attended and spoke at Agile India 2012 in Banglore, India. It was a wonderful experience - the conference was excellent, and my first trip to India was memorable to say the least. I'm quite sure that I'll be returning to see more of the country and experience people and the culture! 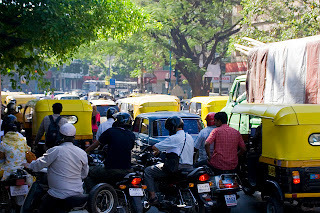 Coming from North America, there was one particular aspect of Indian culture that was significantly different than what I've experienced so far - the traffic in Bangalore! From my 30+ years of experience driving in Canada, the U.S. and France, Indian traffic appears to be complete chaos. If we were to drive like that in Ottawa, for example, the carnage would be indescribable!! However, it all just seems to work, and I saw fewer collisions of any sort than I would have seen during a similar 2 week period in Canada. Why is this the case? In Canada we expect people to stay in their lanes at all times except when safe to change. We expect people to (roughly!) follow the speed limit. We expect people to follow all the rules as laid out by Transport Canada and the provincial transportation ministries. People generally do this, although speeding is one thing that I saw little of in India. In fact, I didn't see a single police car on the road enforcing traffic laws. In a 1 hour period this morning here in Ontario, I saw three! In Canada, honking your horn at another driver is something done as a last resort, and can trigger episodes of road rage. People have had their vehicles vandalized and have been beaten up in fights as a result of honking. If you blink your lights at someone on a highway, it's an angry or impatient signal to "get out of my way". By contrast, in India drivers don't even seem to notice that there are lane markers on the road. They at least respect that (roughly!) you drive on the left side of the road. Drivers are constantly honking and blinking lights... as a way to communicate with other drivers. Honking at someone is a way of saying, "I'm here!" Indeed, many larger trucks have a sign on the back encouraging you to honk to indicate your presence. Blinking your lights at another vehicle is another way of showing that you exist, and that you're 'coming through'. There were several occasions when our driver passed other vehicles on the highway when there was oncoming traffic, and we had 3 vehicles across a two-lane road. No problem - everyone knew that everyone else was there, and we all made enough space to pass safely. Try that in North America, and you would likely have a multi-vehicle head-on collision with major injuries. The fundamental difference between traffic in Canada and India is that the "community agreements" of how we drive are different. In Canada those agreements are based on well-defined and rather well-enforced rules, and that every driver follows them. When a driver in Canada deviates from those rules, the likelihood of a collision increases greatly. In India, though, the community agreements are based on constant communication, such as honking and blinking your lights, and respect for others on the road. I saw many, many more instances where a driver would allow another driver to move into the space in front of him to keep traffic flowing. The two drivers would make eye contact, possibly honk at one another to acknowledge their existence, and the other driver would move into the space. I can recall only a single time over two weeks that the person driving us threw up his hands in exasperation at another driver. In a two week period in North America or Europe, how many times would you do that? In India, there are rules, but they are only followed in spirit and aren't strictly enforced. The use of speed bumps and speed humps provides a low-tech way to control speeding without the same need for patrolling police cars as I see in Canada and the U.S.
Another key difference between India and North America is that the Indian road infrastructure (at least that which we experienced around Bangalore and Mysore) is not built to handle the same volume of traffic as that in car-crazy North America. However, even though it may be slower to drive in India than in Canada, what I experienced was that there was still constant flow regardless of the number of vehicles. Given the same infrastructure in a Canadian city with drivers following Canadian community agreements, you would have gridlock. Teams of people are similar in that they also have Community Agreements - founding principles on which they work. Those principles are usually only implied, although some are occasionally explicitly stated. They will be similar from team to team, just like drivers in both Canada and India adhere to the rule that you drive on one side of the road (the right side in Canada, left in India). They will also be different from team to team, sometimes even in ways as fundamental as the difference between principles behind driving in Canada and India. The key point, though, is that regardless of whether a team is even conscious of the existence of their community agreements, they exist. Each team will over time evolve a way of working that suits them. When I start coaching a new team, during training I ask them to discuss their particular agreements and try to make them explicit. This can take the form of very concrete items such as "our working hours will be such that we're all together between 10AM and 3PM each day" or the coding standards to which the team will adhere to more abstract value-based agreements such as "we want to have fun while working". The best teams I've observed as a coach and worked on as a developer have been the ones that had the fewest rules. They were more similar to Indian traffic where respect and constant communication resulted in fewer fender benders than a long list of rules to which the team had to adhere. There would be the same honking and light-blinking, but not in the angry North American sense, but rather in the spirit of traffic in India. The area in which the team worked had a 'buzz' to it as people talked, but not to the extent that it was disruptive. For example, if someone needed to communicate something, there was a discussion instead of an e-mail. Contrast that with a "rules-based" approach where communication is routed upwards to a supervisor who contacts the appropriate supervisor of the other group, when then communicates within her team. The communication reaches its destination, but how effective is it? Was anything lost in translation? Communication between people is a flow not unlike traffic. As such, I would suggest that the only way to handle the chaos of working effectively as a team of people requires us to embrace the same level of communication and respect as that of Indian drivers. Trying to enforce rules as a means to control that communication would result in gridlock!